The Face of Courage: A Harbinger for Change? This is the first post I am writing since May, as there are many stresses - medical and otherwise which I will not elaborate here - in my life these days. But I could not refrain from writing a little background information first--before I go into the subject of this post-- about the three kidnapped Israeli youngsters, the incident which happened this past Thursday night as they were waiting to hitch a ride home from Yeshiva at a traffic circle in Gush Etzion. Here is a perfect example, in this cowardly kidnapping of unarmed 16 and 19 year old students, of the value system, culture and mindset of our enemies who wish us to disappear from the face of the Earth--yes, not only from the Middle East, but the Jewish people seem to be a thorn in their side; with the rise in Antisemitism world-wide, it's apparent that we're a thorn in the entire world's side. There was one report on NPR that I could find about the kidnapping, here. The tenor is slightly negative towards Israel in the usual NPR manner, mentioning that Israeli forces arrested 150 Palestinians and killed one, and referring to the kidnapped boys as "settlers," and where they live as the "West Bank." Typical.Which is why, although I have my radio set to NPR to automatically go on every morning at 5:30 a.m. (don't panic, I don't get up then. I am addicted to lying in bed semi-awake, listening to the news), I haven't supported them financially for years, because of their subtle undertone of bias against Israel. Canadian Foreign Minister John Baird condemned the kidnapping in strong language, two days after the incident. "Canada is deeply concerned by reports that three Israeli teenagers may have been kidnapped in the West Bank and condemns those aiming to instigate conflict. “We urge the Palestinian security authorities, who have been trained through Canadian and U.S. leadership, to make every effort to investigate this incident and work diligently to ensure the safe return of these children to their families. "We call for the immediate release of the three Israeli teenagers. Whoever has taken this action must be found and brought to justice." Cooperation? Ongoing? Is that why the United States is funding the new unity government of the Palestinian Authority and terrorist organization Hamas? To cooperate in kidnapping Jewish children? Enough. 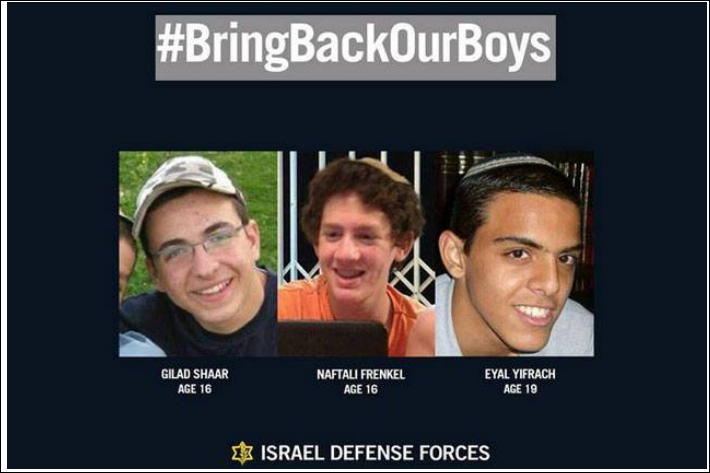 We need people to bombard the State Department, call our congressmen, and strongly insist that they prevail upon our ineffectual president to actively aid Israel in bringing these boys back. Here's one way to do it: paste this URL into your browser. And make the call. Ok, you have the background info, you know one way to actively make a difference. It's time for the subject of this post, "The Face of Courage, a Harbinger for Change." We save the best for last, as it were; as we say in Hebrew, "Acharon, acharon haviv," or,loosely translated: "last, last is most loved." I wanted to end this post with something you would really remember, as it is unusual, surprising, and honest. Watch the video below. This young man has the courage to speak out through a personal video which he uploaded to Facebook. His video spawned a video interview with an Israeli reporter in the Golan. It also spawned death threats, possibly from some of his relatives, three of whom were arrested by the police. 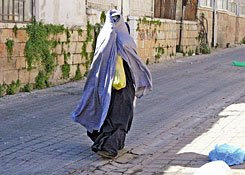 His name is Mohammed Zoabi, and he is a Muslim Arab, 16 years old. Despite the fact that he is also related to this person, Haneen Zoabi, a virulent anti-Zionist member of Knesset, of all the ridiculous things to be allowed--part of what's wrong with Israel today--who very recently condoned the kidnapping. She should be removed from the Knesset and deported to Gaza. The first video is Mohammed's original upload. The second is the interview he gave the reporter in the Golan. This young man, Mohammed Zoabi, could be a harbinger for change in the Arab world. By speaking out so frankly and honestly, couldn't he encourage other Israeli Arabs to speak out for Israel as well? At least, I certainly hope so.